Update June 28, 2018: Mohammed S. Mohamed appeared in court for his bail hearing. The judge set his bail at $1 million dollars, KPRC-TV reported. On June 26th, Houston Police Chief Art Acevedo announced the arrest of a businessman who tried hire a hit man to kill a Houston Police officer for $2,000. The suspect, Mohammed S. Mohamed, 47, owned a shipping business in east Houston. Chief Acevedo thanked a witness who came forward to help police make the arrest. Mohamed allegedly was upset about tickets against his business and felt the targeted Houston Police Officer was interfering with his shipping business, Chief Acevedo said. The suspect originally planned to harm the police officer with acid in the face . The suspect covered his face and identity, Chief Acevedo said. An investigator said the suspect spoke Arabic. The suspect made a $500 payment to an undercover officer, posing as the hit man and agreed to pay the rest of the money after getting proof of the Houston Police officer’s death. Houston Police staged the intended target’s murder, Chief Acevedo said. “He was intent on getting away with it,” Chief Acevedo said. A swat team took down the suspect in a city park. The suspect had $1,500 cash on him, Chief Acevedo said. 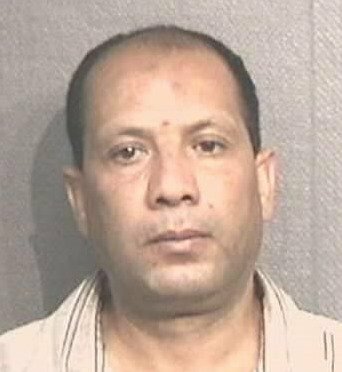 The suspect has been booked into the Harris County jail and has ties to Egypt, Chief Acevedo said. Chief Acevedo believes Mohamed is a flight risk and hopes no bail will be granted. This entry was posted in Asian Community Houston, Harris County News, Houston Crime News, Houston News, Uncategorized. Bookmark the permalink.